UEFA president Aleksander Ceferin called the racist abuse of England players by Montenegro fans on Monday night "a disaster" as the European governing body announced disciplinary charges. The FA said a number of England players - including Raheem Sterling, Danny Rose and Callum Hudson-Odoi - were subject to "abhorrent racist chanting" during England's 5-1 Euro 2020 qualifying victory. "It is a disaster," Ceferin told reporters at the European Club Association's general assembly in Amsterdam. "I cannot say anymore because it is now a matter for our disciplinary committee, but I cannot believe these people still exist." In a statement, the FA condemned the abuse and pledged to help with UEFA's investigation. 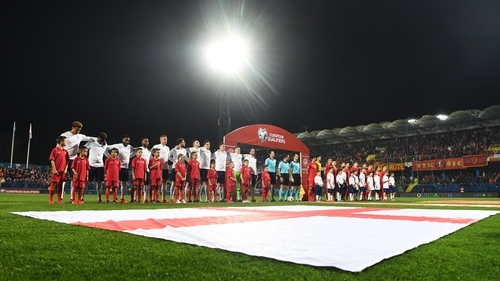 "On Monday evening, England players were subjected to abhorrent racist chanting while playing in a UEFA EURO 2020 qualifier in Montenegro," the statement said. Following incidents at English grounds in recent months, the FA's statement added that it recognised there was also work to be done at home. "The issues we saw last night are not isolated to any specific country, and despite progress English football still has its own incidents of discrimination," the statement said. "Our experience is that by combining both sanctions and education, while working alongside campaigners such as Kick It Out, real progress can be made. But there remains much work to be done. The PFA's deputy chief executive and FIFPro European president Bobby Barnes is also in Amsterdam, and backed Ceferin to tackle the issue after speaking to him on Tuesday morning. "Aleksander Ceferin has expressed his equal frustration with myself that racism had raised its ugly head again," Barnes said. "Aleksander reiterated his commitment to dealing with this stain on our game and to taking strong action once the evidence has been properly examined. "I know from working with him directly on various incidents in the recent past that he has exerted his influence to ensure action has been taken over racist incidents such as this, I firmly believe he intends to tackle this issue." UEFA said the case would be heard by its Control, Ethics and Disciplinary Body on 16 May, prior to the next round of qualifying fixtures in June. Montenegro's next match will also be at home when they face Kosovo on 7 June. Prior to the announcement of the charges, anti-racism campaigners and politicians demanded UEFA changes its approach towards racism, saying Monday's incidents showed the current regulations were not working. Kick It Out head of development Troy Townsend said: "My first reaction is that I'm not shocked any more, whether it's abroad or in this country. "We expect fines that amount to absolutely nothing, a slap on the wrist. Do I expect anything else? If I'm honest at this stage no. "What I would like is stadium closures, expulsions from competitions, federations held accountable for not just the players but the supporters in their care. "Whether they're brave enough or not I will question that all day. But I think the first time that happens (tournament expulsion) it will send a massive message out as to this is not acceptable any more." "At some point I do believe there will be a time when, if this continues, we will get to a stage where players will take the matter into their own hands and managers will do what is right for those players at that moment in time and consider the fact that maybe it's not worth it just for three points. "If we continue to see things like Monday night, I don't think we're a million miles away from that." Football Against Racism in Europe (FARE) - which is due to hold a two-day conference with the FA and UEFA on the issue at Wembley next week - said it had designated the match as "high risk" prior to it taking place, and called for UEFA to act decisively. "We commend the reaction of the England players involved, no human being should have to face abuse and vilification for their race or identity, something that many Montenegrins will understand from the divisive and bloody recent history of the Balkans," FARE said in a statement. Separately on Monday, UEFA announced it had appointed an ethics and disciplinary inspector to evaluate Chelsea's complaint regarding the alleged racist abuse directed at Hudson-Odoi during their 5-0 win over Dynamo Kiev in the Ukrainian capital on March 14.